I was BUSY at work yesterday so I waited to run until I got home. I wanted to get 7-8 miles in but I was STARVING.. Chinese soup was a BAD CHOICE! After I let the food settle, I set out in the drizzly rain and wind. It felt AMAZING to be in the fresh air. I am still learning the neighborhood so the 7 mile route is a work in progress. Down and back on the busy highway then I had to STOP and wait for the light...UGH!! won't do that again.. Then on a BORING road out and back, won't do that again either. Lordy this run was proving to be a MESS. As I headed back toward my neighborhood I had a choice. 1. Turn right and head home ending with a respectable 5 miles. 2. Go straight up to the track, get in 2 interval speedy miles, then head home for 7 miles. I STRUGGLED with that decision as I burped up Chinese soup and the wind/rain was pushing me back. It would have been so easy to call it a day and go get the mail. But EASY that is not me, if I did not do it then I would not get in a longish run this week. When you come to a LITERAL crossroad, I dare you to take the hard path, I guarantee you will be PROUD that you did not take the easy path. Up to the track and there was Coach Paul from Fleet Feet running with 2 guys. I was PROUD to be speeding my way around the track once I saw coach. 2 QUICK miles.... 8:03 and 7:29!!! And I was on my way home. Just before checking the mail my hamstring twinged... UGH!! What was that?? I slowed. I will have to keep that in check because Rock in Roll Seattle is 2 weeks AWAY!!! This weekend I am hosting a Housewarming/Potluck/Early Birthday Party at the new house. Many Bloggy running buddies will be in attendance and I am very excited to entertain in the new place. 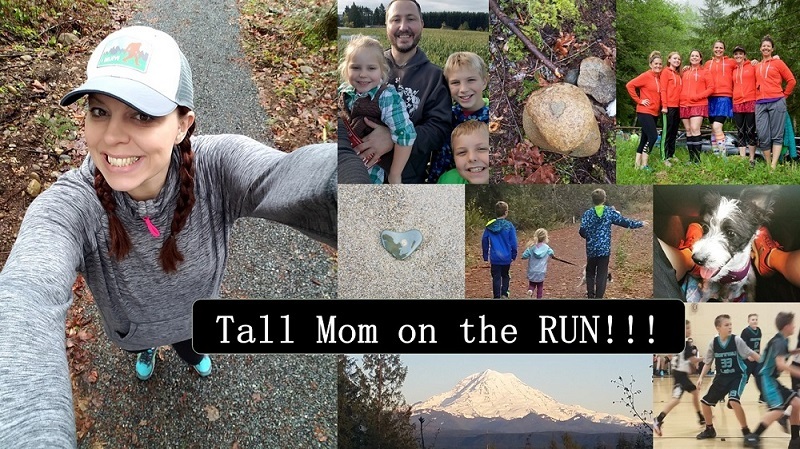 **I know there are more but I am out of time....leave a comment if you are RACING this weekend..
Would you like some link love on a Future High Five Friday? If so please email me at tallmomontherun (@) hotmail. Nice job getting in the two speedy miles. thanks for the high five - I'm gonna need it tomorrow while running in the heat. Have a fun time at your party. Everyone must be busy! I am never first. Odd. You are brave to eat before a run. I rarely ever do that or I loss it along the way. Weekend? Family Bday party for s'ghetti girl and of course, more running. Hopefully a longish trail run since Hubbs will be home! 7 miles is a lot for THursday after work. Way to push on and squeeze out some speedy miles too! I hope that hammy is a-okay!! Way to get those 7 miles. I'm racing in a 12K race tomorrow morning. I'm hoping that its early enough to beat the major heat but with this South Georgia weather, I doubt it. Way to push yourself!! Congrats! Yay! I have my very first give away too! After that, I'm spending the rest of the day in Portsmouth, NH with friends. Have a great weekend! I can't imagine eating soup before a run. My stomach needs to be empty; as long as the rest of me is fuelled, it's all good. Take care of your hamstring. And, enjoy your housewarming. Great job with the miles! I'm running the Central Park Women's Mini 10k. So excited! oh no, am I to late for a high five. I am doing the Worcester Half Marathon on Sunday. My first one! hoping my training paid off. I'm excited to see you tomorrow! Running the Helvetia Half Marathon in Hillsboro, OR tomorrow morning. Good luck to everyone racing this weekend! i have to admit I started the second blog because of Blogher rules and sometimes it drops my entries which stinks for the retailer, but is great for my readers! I like that you have a giveaway blog...what a great idea! I have my FIRST MARATHON this Saturday!!! Only 9 hours to go!!! I will be at YOUR house celebrating your birthday and your lovely new home!!! Thanks for the HIGE 5! I think you know my plans!! =) Can't wait!! fun fun fun!! Have a great party and fun weekend!